I had another nice look at Mars as the weather over here continues to be unusually calm and warm for the time of year. Seeing was very good and as seems to be the norm this apparition because of the dust storm, the light areas (polar cap and hellas) stood out more against the dessert plains than the dark albedo features did. During fleeting moments of very calm air, sinus sabaeus was spotted as a a little darker and sharply defined streak (in contrast with the more diffuse Mare Serpentis above (south)). Great sketch! What materials used? Marker for background? My kids yellow and brown colour pencils, and a marker for the background. 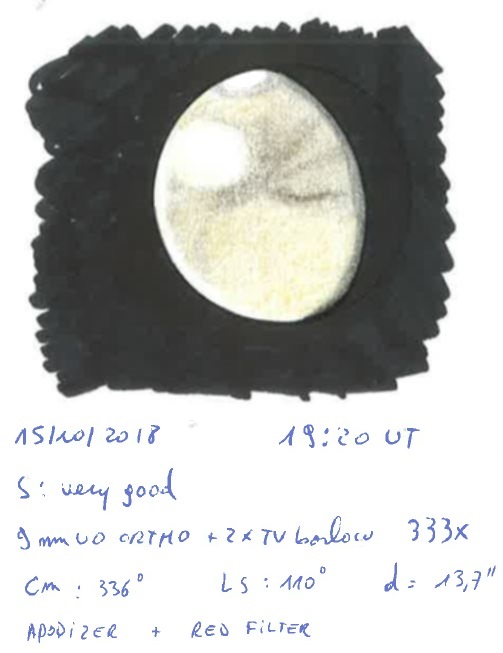 Fine sketch of Mars (On 15/10/'18) . Great sketch Kris. I see that Syrtis Major was just barely visible. No wander that I basically missed it on October 13 and 14 when I was observing at similar CM. Yes Syrtis major is only a ghost of it's former self this apparition. But it's also near the limb in our sketches, so possibly beneath some clouds or limb haze, further reducing it's contrast. Kris, tonight I got Syrtis Major more closer in the centre of disk. I did not miss it tonight, still it was quite difficult to notice it at all. It was definitely far less dark than for example Hesperia Planum.